My name is Maria Cruz. I had arthritic pain in my knees. I've been taking Arthmender for 2 months with Ayurtox now. I feel brand new, I've had very good results and I can move as before. My name is Maria Helena Carneiro. I live in Rio Grande do Sul, Brazil. And I have been taking the Cardiofy, Ayurtox for about a year now. And I have been feeling a wonderful improvement. My blood pressure which was always very high, is now being normal thank to this supplement. My cardiac problems has stabilized, I no longer take so many drugs as I used to, I am above all saving a lot of money with this as my prescribed medicines were very expensive. And I continue to keep taking the supplements for the heart, blood and detoxification as I have been taking, and above all keep feeling as good as I am now. On top of these supplements, I also take ClariMind as I was having a serious problem with memory loss, and I was forgetting people's name, I was forgetting what I was suppose to do, sometimes I had an appointment and I had to make notes not to forget, but I forget where I placed my notes. So I had transformed my life in a very serious concern, as I could not have a normal routine as everyone does. So I had transformed my life in a very serious concern, as I could not have a normal routine as everyone does. But I have taken so many medications, medications prescribed by doctors, friends, and nothing helped me. But when I came across with the supplement ClariMind and Ayuverdic treatment. I ordered it and started taking it and immediately felt the benefits, of course I still have some memory loss but comparing to how it used to be before taking ClariMind, I am very good now. I recommend it to everyone that is suffering like me to use these products. My name is Oscar. I used Ayurtox for about 5 months. Before, I was having a lot of troubles with my digestive systems. Now, I feel wonderful, my energy came back and my bowel movements improved a lot. I am so happy that I just found India Herbs. The only problem is that it is difficult to have direct communication with their representative or perhaps I don't have the right way to do so. Thank you. Bye. Hi, I am Binod, from Australia. I was having stomach problem for a long time. And one of my friends recommended me Ayurtox, because he was also taking Ayurtox for a long time. And, he said that he has got too much relieved. So I start taking Ayurtox from July and in three months, I was getting better and better, before I used to have my stomach problems like indigestion and my stool was very smelly. I used to go toilet for 3 or 4 times a day, and sometimes 5 times, 6 times also. And, it was very hard for me to go in friends' and family's toilet, but now my problems have solved a lot. I am getting better and better. So I hope to fully recover my stomach problem. Before I can't take anything, I'll start to have indigestion, but now I can take something, it has improved a lot. It does not occur, indigestion for anything else. And I take Ayurtox two tablets a day, it's helping me very much for my stomach problem and the digestion problem, and the smell of my stool has gone a lot, and not like too much, I smell like before. Now, I go to toilet for 1 or 2 times only and getting too much relieved. Thank you for the Ayurtox and I hope it will become my ultimate problem and be fully recovered after 6 months. Thank you for Ayurtox, thank you very much, India Herbs. Hi, this is Eric. I just ordered my next lot of Ayurtox and Kama Raja - 4 boxes each. And I'm very pleased with both of them, thank you very much! I noticed the difference especially with the Kama Raja right away. I am also doing the exercises with the Kama Yogi book that I bought last time. The Ayurtox is an ongoing thing but I noticed that it flushes me out quite efficiently - obviously I've been going. I haven't ordered recently. I have been out for about a month but I want to get back to it again because I miss the both of these supplements and I really enjoy using them. And I'm glad you've made them into a ... and I'm also a big fan of Ayurveda on its own as well anyways. But I'm glad you guys are out there doing this stuff and I discovered you on the web which is a wonderful resource for us all I think. I really like being able to continue my custom with you by way of the web as it is. So I hope you stay in business for a long time and I'll be reordering as time requires. Thank you so much. Bye bye. Hello, my name is Steven. I am here to leave an audio testimonial. I have been on Ayurstate for about a year now. And it was working fairly OK, then i started taking it with Ayurtox. And after i started building at it, I guess, it's really working a lot better. So, i don't know, I guess it's different for everybody, but I have found that if I take both, I can get more benefits. But, yeah, I was probably getting up maybe 4,5 times at night going to the bathroom. But now, I can really sleep 6 to 8 hours without getting up. When I get up, at least I thought I go to the restroom, but that's 6 to 8 hours later. I wish I can get, you know, some sleep without being disturbed. Oh yeah, I am 33 years old. There was a doctor on the cruise ship that recommended that i start taking it from Columbia. Most of the American doctors know about this, but.. .Anyway, it's been pretty good. Ok, thanks a lot. My name is Rodney. And I have used six boxes of Ayurtox so far, and I found it to be working well. It purifies my body and it gives me extra energy to do my routine work. Before Ayurtox, I could hardly move, I felt tired whenever I do anything. I am very pleased to use the product and I am placing a next order. Thank you bye. Samuel. I just want to say that I'm very much impressed with the product from India Herbs. I've been using Cardiofy for some time, about a month now and I've seen improvement. I just began to use the Ayurtox for body detox. This is my first week and I'm looking to see a great more improvement. I'm happy with this product. Thank you very much. Bye. My name is Eliede, from Rio, Brazil. I am suffering from joint pain since 1982, and the pain started with my knee. I went for many treatments, taking a lot of Cortisone substances and none of them gave me a result. And so, it was until last year when my knee became aggravated by arthritis, and I had to go for an operation. And now in January, I could still feel the pain. I found these supplements, Arthmender and Ayurtox which I have begun taking. And I am only taking it for more or less than 4 months, I began to feel the relief for my joint pain after the first month, and I felt relieved as things got better. So I can only recommend and I would recommend to anyone who has joint pain like in my case of rheumatism and arthritis. If you found it in your blood test, I would recommend you to try them and it can relieve your pain gradually. Hi, my name is Carmen Meza of Venezuela, I will attest to the benefits they have had in my India Herbs products. I decided on Ayurvedic medicine because I have more than 30 years suffering from illness, taking traditional medicines very expensive and produce on me numerous collateral damage. Until now, chemicals have damaged my digestive system: suffer any chronic Gastropathy due to acidity pills, muscular dystrophy due to injections. Realizing that I did not improve, but with time my condition has been getting worse to the point of heart attack, and laying prostrate in the bed he could not lift at all, so I decided to try this type of medicine. The experience has been wonderful. Cardiofy that I am taking for the last 5 months with the Ayurtox for detoxification of the many chemicals that I took before. And this has led me to be so happy that I did not hesitated to place an order again .My doctor, after my recent laboratory reports has found me in a great shape, he also told me I was better than him. So I do not doubt, by these results, to recommend it to anyone. All, all those people who, like me, that have passed so many years of illness, You should try this. You will not really regret it because this is not a publicity, I do not get paid for this, I'm doing because I am really convinced, because I experienced in my own person and has given me great results and am very happy and grateful that this exists, this alternative to give us a better quality of life. Thank you. My name is Cediel Evangelista Ramos. I am 57 years and live in Ciudad Bolivar, Antioquia Colombia. My problem is mainly on my prostate, the doctor sent me to an urologist, and they prescribed me the same drugs. The doctor told me that I could have contraindications not only for the loss of my sexual potency, but also to relieve pain, but it's not cured and did not produce any short-term improvement. Then I found out about Ayurstate through the Internet from India Herbs, I have made the purchase in the month of December, 2009. I started to consume it from January, 2010. Initially, after consuming capsules for 6 months, I purchased 4 more boxes. That is a treatment that I feel great most of the year. And, it has improved my urination and I no longer feel the discomfort when urinating. I think the medicine has served a very good quality, so now I am making another order for maintenance, to continue improving and maintaining this way that I have had now. I have logically accompanied by the signs of improving and maintaining the nutritional level to counter stress level which can be an effective treatment. While taking Ayurstate , I took Ayurtox too, this product has helped me to detoxify and, that is why I am consuming this excellent product today. My name is Miguel Angel Garcia and I live in Spain and I'm taking Ayurstate in conjunction with Ayurtox for a year. I have noticed an improvement especially at my prostate level, before I had problems with high PSA and now it has been standardized. I do not urinate frequently, and now I can easily stand longer for 2 or 3 hours. I also noticed that thanks to Ayurtox that I am taking in combination with Ayurstate, this year I have not suffered seasonal allergy. Usually, I had allergies from April or May until June. But this year I do not know if it's because of Ayurtox, but I have not had any seasonal allergies. I will keep on taking it to improve even more and I have recommended to a friend as well. Nothing else, I am very happy with Ayurstate. Thank you. My name is Ursula and I'm from Paraguay. 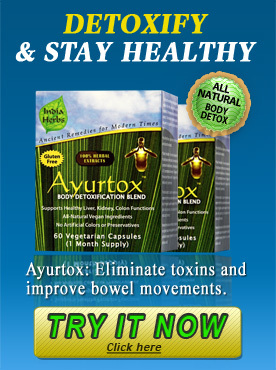 I purchased Ayurtox because I had intestinal problems and some other problems. The intestinal problems are getting better and I feel better. I do not have fatigue as before and that's why I am ordering Ayurtox again as well as other products from India Herbs. I'm Villadiego Orlando Becerra, and I live in the city of Cartagena, Colombia. I have purchased products from India Herbs. I felt a lot better with the results of Ayurtox and Ayurstate; products for prostate and a product that also serves to monitor all processes in the body. I felt an improvement so far. The truth is that it is positive that these products are in the market for the use by all persons who wish to do so. I bought this formula two years ago and used it for a few days and then stopped because I did not have any testing device to check to see if my blood level was affected. Sometime last year, I was finally able to secure an insurance to pay for my medications and to see a doctor. She prescribed Metformin for Diabetes. I used this and totally forgot about the AyurGold which was in my cabinet safely hidden from my sight and mind. Some months later after, I was dissatisfied with Metformin which my doctor had prescribed. It did not help to lower my blood levels and only increased my frustration every morning. I ditched all my medications including Metformin. I started using something called Triphala and then later I stumbled upon Amalaki and Brahmi. I used theTriphala (powder form) for more than a month and then someone told me to discontinue because it is a strong detoxifying agent and should not be used everyday like a nutrient. I actually lost a lot of weight and stopped but I thought that maybe I should use one of the fruits which make up this formula, Amalake. Apparently, it contains vitamin C. I was also using Turmeric every morning. I was beginning to feel light and energized. However my sugar levels were reading around 140 approximately and I thought this was a good substitute for the Metformin. A few weeks ago, I came upon the boxes of AyurGold and Ayurtox and took an interest in reading the back of the box which gave a description of the Proprietary Blend. Imagine my surprise when I saw that one of the ingredients was Amla. I took one capsule of the AyurGold that evening and the next morning my sugar level was 132. I was so delighted that I began to pay attention to what was written on the box itself. I tested everyday after that and saw that the AyurGold was actually bringing my sugar levels down to 130 which I never had achieved when I was on Metforin. A few days later while I was in an organic store I discovered Gymnema and Shatavari which I promptly bought after checking on my iPhone and noting what those two ingredients were used for. I then started to use the AyurGold everyday morning and every night except I also added the Amalaki and gymnea. Later on, I found two other ingredients on your box and also added them to my routine, Shatavari and Neem. I just wish to express my gratitude to you for the good results I am enjoying from your product, Ayurtox. Upon concluding the first month of this regimen, I Can sincerely say! I HAD NEVER FELT LIKE HOW I FEEL IN THE LAST 20 Years. Your product had left me speechless. During this last weekend, I was in N.Y. And I had spoken to no less than 15 person about your product, I now some of then will soon be contacting your for purchases. This is what I want to say. I am INTEREST of becoming a DISTRIBUTOR for your products . I know an handful of people that need help. Please tell me how can I become one of your distributors? Good morning, my name is Jose from Colombia. I am giving my testimonial to everyone. I have been using Kamaraja and it is a very good supplement, relatively very good in the benefits that you will receive. The supplements are spectacular. I take Ayurstate for the maintenance of the prostate and also Ayurtox for detox. I testify because Ayurveda is the best you can find in the market and does not load the body with chemicals like common drugs do. I thank India Herbs for all their products, I fully trust it and I am happy with the effectivity of ithem. I hope that people will listen to my testimonial and Latinos who have prostate problems or impotence can benefit from it as well. I hope this testimonial will help many men and women. Thank you. Dear sir, I have used the following products for approximately 2 years. I have ordered them in 6 months supply each time: 1. Ayurstate 2. Ayurtox 3. AyurGold I found these products to be very good. It has lowered my blood sugar levels, detoxified my system and cleaned my colon and according to my doctor, my prostate is very healthy. I have no hesitation in recommending these products to do what they are advertised to do. Thank you. Yes, we received the supplements. Thank you. I should have emailed you but I think everyone in my house has gotten the flu over the past couple of weeks and time has ran away with me. Myhusband and I are both very impressed. He is taking the prostate formula [Ayurstate] and reports now into about the 2nd week that he doesn't feel as "gassy" etc and has more energy. As for me with the detox [Ayurtox], It's amazing! I have more energy, I feel " lighter" and my irregularity is starting to go away. For years I have been told I have IBS but after visiting a nutritionist I was told I wasn't digesting my food but your product is helping me to do that! I have lost about 2-3 pounds and I am noticing a significant difference in my skin as well. This is only after 2 weeks so I can't wait to see how things turn out over the long term. We will definitely be ordering from you guys. I have told a few people I work with about your products and right after the Holidays they will be ordering as well. Thanks again so very much! My name is Andrés, I'm from Spain. I am having some difficulties in my prostate as I am urinating up to 5 times a night. I came across with the Ayurvedic remedies and started to take it about a month ago, I took Ayurstate along with Ayurtox supplements that I won't regret. My urination has reduced by 50% and I felt relief in my prostate. Therefore I decided to continually consume these products for up to 6 months or more as indicated by their ayurvedic doctor. And so, for those who want to feel the same result, I would like to share with people and recommend them because they are very good.